In the first 45 minutes of the game, Ghana illustrated why they were the favourites to win the game. The Ayew brothers were at the centre of the game and ensured that almost every attack the Black Stars made either went through them or ended with them, while Christian Atsu bullied Joseph Ochaya for the majority of the half with his direct running and dazzling footwork. Atsu and Dede Ayew were not afraid to take on their opposing numbers, allowing them to ping in multiple crosses into the box during the early stages of the match. Two notable crosses failed to be converted into goals via Asamoah Gyan’s head as Ghana continual knocked on Uganda’s door. Onyango had to make a brilliant save to prevent Dede Ayew from scoring at a time where The Cranes were soaking up pressure. Gyan atoned for his earlier misses by winning a penalty in the 30th minute. Isaac Isinde intercepted the ball with a poor touch, allowing Ghana’s captain to gain possession of the ball. Isinde’s reaction was to pull him to the ground and the referee signaled for a penalty. Dede Ayew stepped up and slotted the ball passed the goalkeeper to put Ghana ahead. To Uganda’s credit, their response after going a goal down deserves praise. Perhaps it was their determination or Ghana’s complacency (or both) that contributed to their fighting spirit and will to get back into the game. 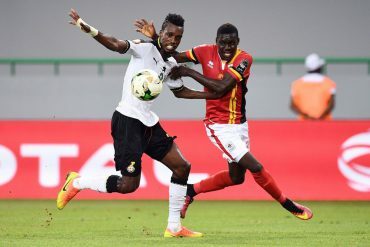 Two opportunities before the first half were the catalyst: a counter-attack involving Faruku Miya’s shot hitting the side netting and then a cross from him that nobody managed to get a head to should have provided the incentive for Ghana to up their game, but it didn’t. Miya continued to trouble the defence with his crosses, causing temporary panic in Ghana’s penalty box. Tonny Mawejje and Joseph Ochaya (who improved exponentially in the second half) saw their long range shots sail just wide of the mark, while substitute Muhammed Shaban’s attempt at beating John Boye was thwarted by Razak. Geofrey Massa was a key player in Uganda’s late push. It all began with a thunderous free kick from distance that just sailed over the bar and continued with a contrasting weak shot into the arms of Razak. Baba Rahman’s injury in the first half weakened Ghana’s left side, allowing Massa to continue rampaging and being a creative force. A poor punch from Razak fell to Baroka front-man, who laid it off to Miya but the shot was scuffed. The Pharaohs came into this tournament expected to play disciplined football, much to the frustration of their fans. Though this performance wasn’t quite as backs-to-the-wall as their recent victories over Nigeria and Ghana, for instance, they were still relatively defensive-minded and reliant on the pace and skill of Mohamed Salah and Mahmoud Trezeguet to unearth goal-scoring opportunities. In Mali they faced a side that was defensive-minded, too, and roughly around their level. In SFG’s tournament preview for Egypt Salah was named as not just a key player but the key to their system. The pace of Hamani Traore matched Salah’s, ending in a quiet game for the Roma winger when he was substituted in the second half. Given the emphasis on defence on both sides it’s no surprise that it turned out to be a stalemate; a game of few chances. A pitch that was deteriorating as the game went on didn’t help for a fluid game, with wayward shorts, crosses and clearances aplenty. A major plus for Mali, on a day Bakary Sako and Sambou Yatabare misfired (and were unaided by a poor pitch), was the second half cameo of Yves Bissouma. The 20-year-old had a good African Nations Champions last year as Mali finished as runners-up to DR Congo, scoring a ice-cool late winner versus Ivory Coast in the semi final. He showed his potential in the last 25 minutes as he roamed centrally and wide with real intent in search of a decisive pass. One of Mali’s best openings came when he played through Moussa Marega late on in the game. Unfortunately for them Essam El Hadary’s strong hand beat Marega to the ball. The pitch wasn’t the friendliest, particularly to technical players like Bissouma, but it’s fair to say Mali could have done with a Bissouma for this game rather than a Sambou Yatabare. The considerable Mali community in Gabon came out in droves and made sure they made themselves heard. It was one of the most impressive turnouts by fans of a non-hosting country in recent times, up there to rival Ethiopia’s opener against Zambia in 2013. Mali had good support in Gabon back in 2012 and such strong support will only aid their chances of getting out of Group D rather than harm them.